One dish, eight kinds of alcohol – Hello Korea ! IMG_0242, originally uploaded by Almost-Human. 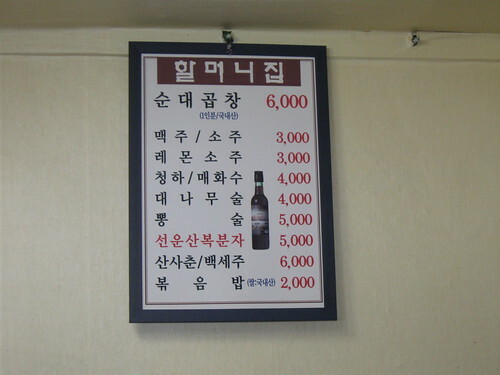 A $1.33 bottle of soju is enough to knock a grown man on his rear and is cheaper than o.j. But most people here prefer beer because it is seen as higher class. And if you order imported beer, then you are really something. And you can’t drink without ordering something to eat here, unless you are at a Western bar (where the drink prices will be AT LEAST double triple) And even there, bottles are typically ordered as a “set” with food. Why do I know this? Because when I meet my teacher friends out in Seoul, they are buying these drinks. Me, being one of the proletariet I learned long ago to not spend money on spirits. I’m every bar owner’s worse nightmare, the one who drinks beforehand and only buys one drink for appearances. This strategy has served me and my budget well all over the carribean and in Seattle, so why not here?